Despite the recent excitement regarding Private sector led poverty reduction, there has been little evidence on how they can uniformly do so, especially by incorporating poverty reduction goals in business strategies. 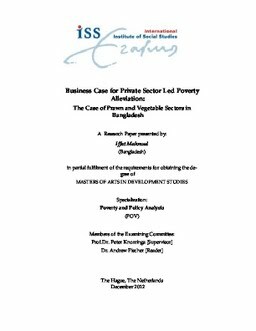 This research is an attempt at highlighting the means by which business enterprises in developing countries like Bangladesh may benefit the poor through increased incomes and jobs by making profits themselves. By analyzing market development interventions conducted by one of the most proclaimed private sector development projects, Katalyst, this research draws out the enabling and deterring factors to business growth and poverty reduction. The research findings point to the need for governments and donors to create an enabling business environment through which business enterprises can have better access to growth capital; can make long term investments, specially on research and innovation; ensure improved co-ordination with the relatively poor value chain actors; and thus benefit from increased profits and business expansion. It is established in the research that businesses in developing countries cannot ignore the empowerment of the poor in terms of incomes and jobs because it benefits them directly with higher profits.